Experience a joyful transition to preschool with this child-centered progression through art and play-based curriculum. Prepare children for a life long love of learning. 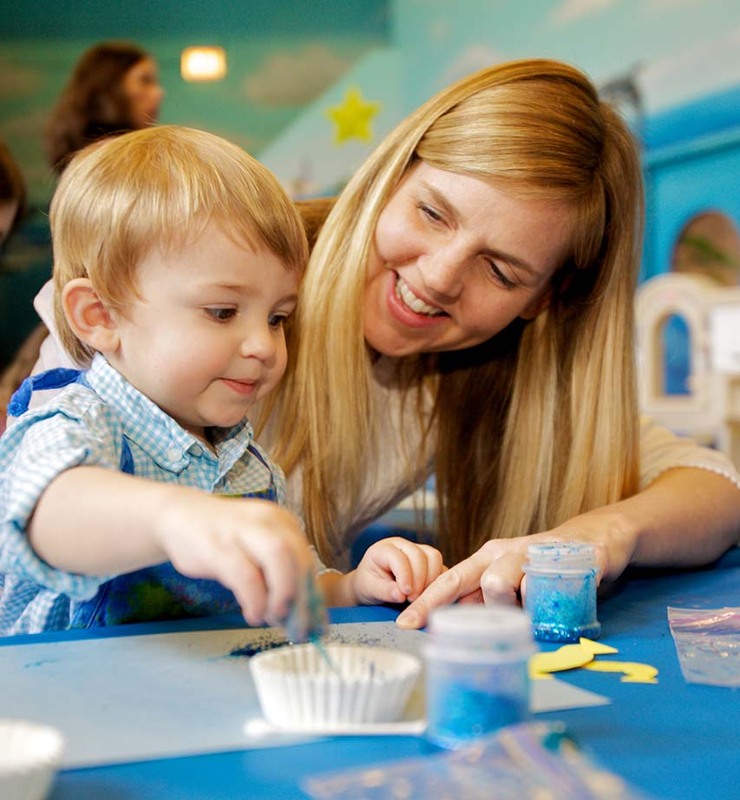 Pre-preschoolers and caregivers will co-experience a condensed preschool morning together including: circle time, instrument play, snack, story, art, open play and expert guidance from Bubbles Academy teaching artists. Community Building and Socialization: Our pre-preschool students are greeted by their teacher and then welcomed into the class circle, which features a sensory bin of props, toys, costumes pieces and more to gather children’s interests and incite a desire to participate. Cooperative Learning: Circle Time is a group experience of high-energy songs, dances and question-and-answer interactions between our students and their teacher. We’ll stretch and practice body part recognition as we touch our head, shoulders, knees and toes! Your teacher we’ll ask about the weather outside and sing about our ABC’s and 123’s. Week-by-week, this dialogue contributes to your child’s communications skills and confidence. Learning through Play: Open Choice playtime encourages exploration and allows for your child to gently become accustomed to both taking turns and sharing. Your teacher creates various stations to benefit your child’s sensory and fine motor skills, like the water table for scooping and pouring, as well as Play-Doh for rolling and molding. Kitchen toys and baby dolls engage Bubble Preppers in early pretend play. Sensory Development: Art Time is a special collaborative opportunity for caregiver and child to focus on attempting all steps of a project together — from spreading glue to shaking glitter! The finished product is a source of accomplishment for your child. Each week presents new mediums and eclectic art tools like sponges, bubble wands and the best artist tool of all, our hands! Early Literacy Development: We gather as a class community in our yellow chairs for crackers, juice and a dynamic book read. Your teacher engages students in a story that relates to the weekly theme and the art project completed. 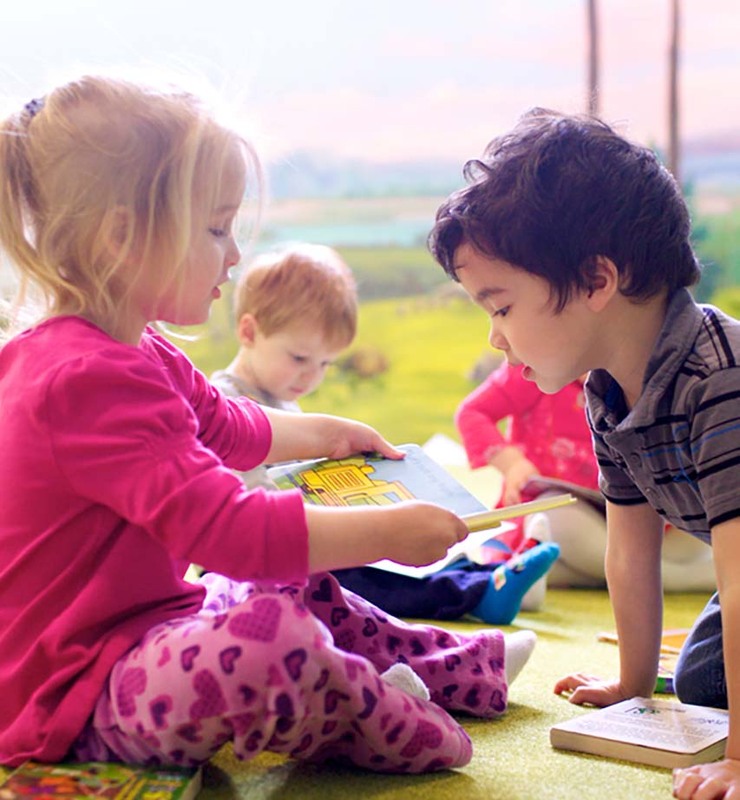 Story time grows your pre-preschooler’s listening skills, as well as contributes to his or hers later language, reading and writing development. Encourage early independence and socialization in a nurturing environment. Pre-preschoolers focus on developing strong listening and fine motor skills, while caregivers observe from the sidelines. Children experience: circle time, instrument play, listening exercises, cross lateral movement, empathy development, snack, story and expert guidance from Bubbles Academy teaching artists. Learning through Play: Students are welcomed into the Bubble Me classroom by both their teacher and an inviting Open Play set-up. Soft-foam climbers, balls and blocks provide a playground for big movements — not only by arms and legs, but also for acts of sharing and turn taking. Before engaging in creative movement, students are asked to clear and clean up the room together. Gross Locomotor Movement: Your teacher leads across the room run, dance and stop-and-go games that exercise not only toddler feet, but also ears. When students join together to catch twinkling stars, bend down to touch toes, or trot like happy horses, they are building strong listening skills and widening their expressive vocabularies. Socialization: Our teachers lead class songs, rhymes and phrases that have comforting power — promoting hugs, high-fives and proud announcements of “I like myself!” The intimate sing-a-long experience inspires first friendships between children, practices handholding and another very important step — your child embracing his or her teacher as a caregiver. Independence: As parents observe from the perimeter of the classroom, toddlers receive from both them and their teacher the extra encouragement to engage in positive behaviors key for a successful preschool experience. Gain confidence in independent learning while experiencing a condensed preschool morning. Pre-preschoolers participate in this class on their own. 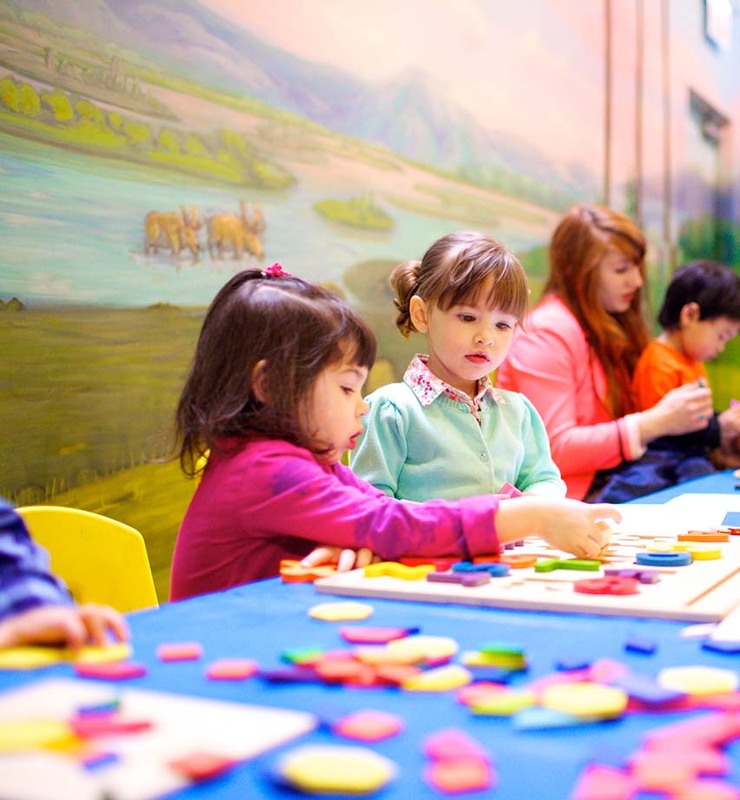 Each class includes learning experiences such as: individualized separation plan, circle time, movement, instrument play, snack, story, art, open play and school readiness guidance from Bubbles Academy teaching artists. Learning through Play: Once greeted by his or her teacher, your Bubble Stepper will enter the Mountain Room, a welcoming field of fun on the first and every day after of Bubble Step class. Soft-foam climbers and activity stations stir not only young attentions, but also catapult relationship-building interactions between both student and teacher, and student and student. Cooperative Learning: Circle Time is a group experience of hellos and full-body movement. It fully exercises your child’s developing vocabulary and recognition skills. We wave our scarves at our neighbor, answer the questions of the day and gain trust in our teacher as a caregiver. Sensory Development: Art Time is all about expression as well as collaboration! We’ll create a mural of colorful tracks with toy cars as our brushes, or add swirly designs of “hair” to an image with shaving foam paint. Projects are highly tactile and motivating for our young artists! Independence: Not only is independence encouraged during art time when your child puts on his or her own apron, but also during Story & Snack. We practice good table manners together and dive into a story. Students are asked to open ears to a new tale each week! At the end of the class day, snack is a calming, intimate and focus-building segment for your child.